7 – 8pm — Spring Singing Bowls Concert! Celebrate Spring with an Amazing Sound Bath! We are so happy to have Sarah Westbrook, sound healer, return to play her singing bowls in this Spring concert! We will begin with each of you lying on a yoga mat, comfortably. Then you will be treated to a guided meditation to ease you into a lovely place of inner expansiveness, your entryway into bliss. We will enjoy an improvised concert with crystal singing bowls and light language chanting, with the intention of helping you clear whatever doesn’t serve you, and to make room for Spring blessings! You will experience stress relief and physical and mental healing. It feels amazing! Please wear comfortable clothes, and bring anything you will need to lie comfortably for an hour on your back, such as a yoga mat or camping pad, a pillow, blankets, bolsters, an eye pillow, or whatever serves you. Cost is only $30. Only 20 Spots Available! Pre-Registration Required; to Save Your Spot Click HERE — Sound Baths Fill Up Quickly! 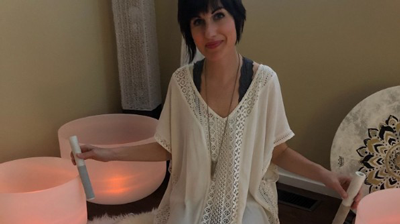 Sarah Westbrook, is a Reiki Master and does private and group healing sessions. She has been working with sound for the past several years as a way to bring about spiritual and physical transformation and healing. She is excited to bring her gifts to you! Her intention is to help you to open up to healing in a deep way. Maureen Rivelle, Reiki Master, has her Open Hands Reiki healing practice at Daylight Healing Center, and loves to share her gifts of healing with the world. She will be sending Reiki energy with her voice during both the meditation and the chanting portions of the program.